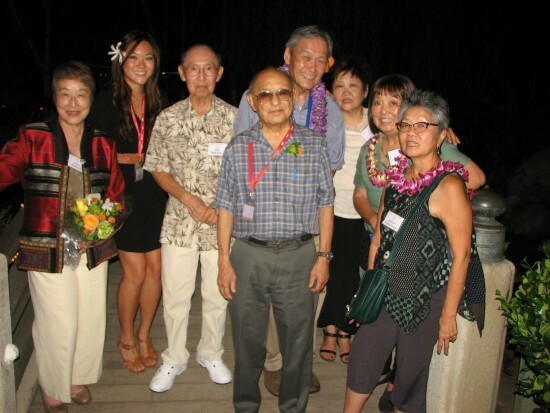 Speakers and honorees (from left): Yoko Pusavat, Megan Ono, Jim Matsuoka, Lloyd Inui, Alan Nishio, Chris Aihara, Carrie Morita, Evelyn Yoshimura. 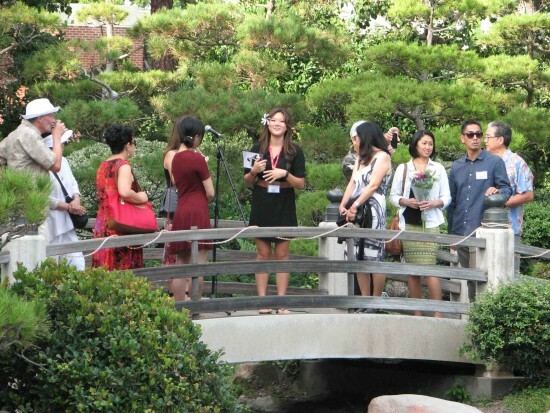 LONG BEACH — It was an evening of both nostalgia and hope for the future as nearly 200 people gathered at Cal State Long Beach’s Earl Burns Miller Japanese Garden on Sept. 27 for the CSULB Asian American Studies (AAS) Reunion. The event was open to past or present students, faculty, staff and anyone else connected with the Department of Asian and Asian American Studies (as it is now known) since its inception in the late 1960s. 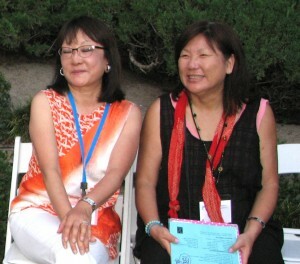 Reunion committee members Audrey Yamamoto Kamiya and Diana Ando Ono. 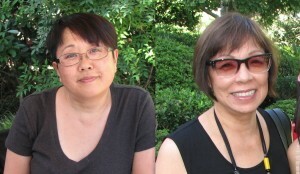 The reunion committee also included alumni Patty Ito Nagano, Sue Oda Omori, Diana Ando Ono and Kathy Tokudomi. Dan Kuramoto, Kimo Cornwell and June Kuramoto of Hiroshima performed. Dan Kuramoto was also an honoree. Evelyn Yoshimura and Carrie Furuya Morita, who continue to be active in the Little Tokyo community today, were recognized for their role in establishing AAS and their lifelong commitment to social justice. 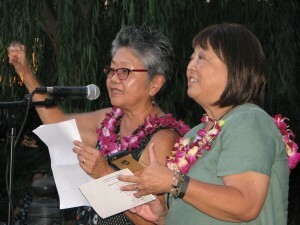 Reunion committee members Kathy Tokudomi and Sue Oda Omori. Yoshimura and Morita dedicated the program to activists who have passed away, including Charlotte Murakami, “Big Bob” Uno and Art Sumi. Megan Ono gives a tour of the Earl Burns Miller Japanese Garden. Inui, one of the evening’s honorees, remarked, “One of the best things … about an event like tonight is that it gives us a chance to enjoy each other and renew some of the times we had with people that we seldom have a chance to interact with. But besides that it also reminds us of that era, a time and events which … compelled us to get involved. And that resulted in us becoming students and social activists in that period. “So much has transpired since that time, but having a reunion here in 2015 at Cal State Long Beach’s Japanese garden … is quite appropriate because I think we can claim that we had a part in enabling the garden site that we’re enjoying this evening to become a valued part of the university. A very different garden would be here today if student activism didn’t continue in compelling the university to seek the funds and make the fundamental changes of the original design and layout of the garden. 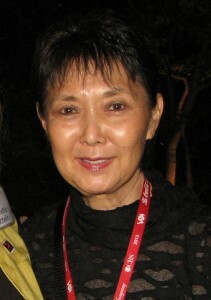 Reunion committee member Patty Ito Nagano. Miko Shudo and Friends performed. Another honoree was Alan Nishio, former CSULB associate vice president for student services and a leader in many community organizations, including Little Tokyo Service Center. He was introduced by Jim Matsuoka, former EOP (Educational Opportunity Program) director at CSULB, who was recruited from UCLA by Nishio. 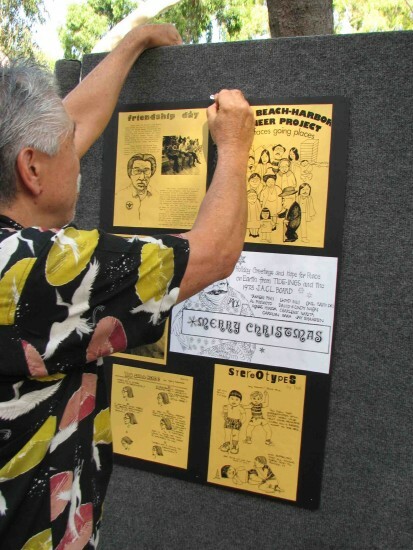 Steve Nagano posts CSULB AAS flyers from the 1970s. Franklin Odo, who taught at CSULB from 1972 to 1978 and is currently a visiting professor at Amherst College, was unable to attend but sent a tribute to Inui and Nishio that was read during the program. 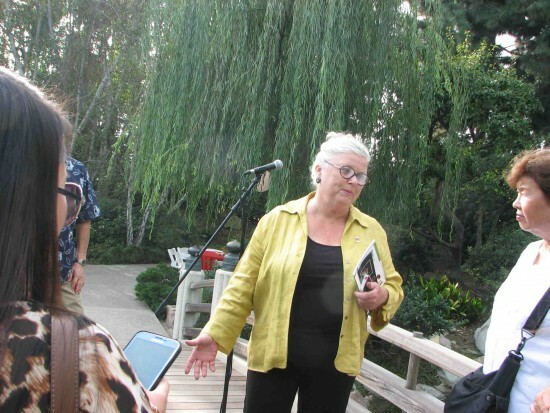 Jeanette Schelin of the Earl Burns Miller Japanese Garden gives a tour. The younger generation was represented by Megan Ono, a second-generation CSULB grad who has been a docent and membership/marketing assistant at the garden and has been active with Nikkei Student Union and Kizuna. Honoree Yoko Pusavat with Barbara Kim of the Department of Asian and Asian American Studies. 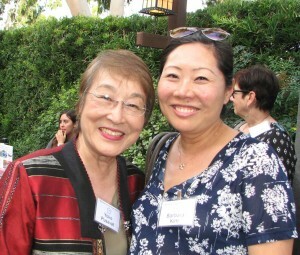 The evening’s final honoree was Yoko Pusavat, professor emerita in Japanese linguistics, a board member of the Earl Burns Miller Japanese Garden Educational Outreach Committee, and vice president of the Long Beach-Yokkaichi Sister City Association. Evelyn Yoshimura and Carrie Morita gave a rhyming introduction of fellow honoree Lloyd Inui. In the 1970s, Pusavat developed a Japanese curriculum based on the communication-based approach used to teach Spanish and German. She was instrumental in launching a Japanese BA program at CSULB and later a Japanese credential program that has produced teachers at the high school level. “By teaching, I learn, and then by learning I can do something for myself as well as do something for others … I can make a little bit of difference in somebody’s life,” she said. 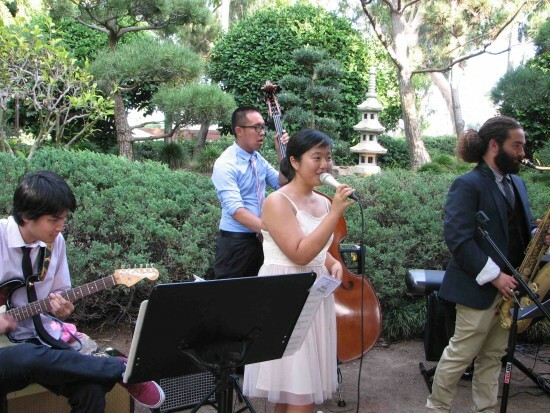 The event, which was catered by Cherrystones in Gardena, included tours of the garden led by Ono and Jeanette Schelin, senior director of the garden, and music by Miko Shudo and Friends. Proceeds will go to provide an opportunity for a student to work on an Asian Pacific Islander community project. J.K. Yamamoto is a 1981 graduate of CSULB and a member of the reunion planning committee. 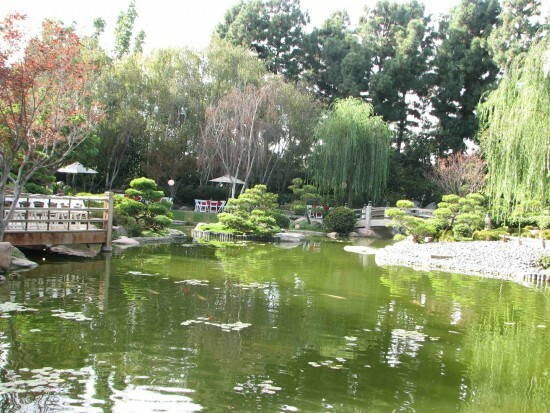 The Earl Burns Miller Japanese Garden provided a tranquil setting for the event.